The MRC-Geanna class canal boats. This is an ideal boat for larger groups or for those wishing to have spacious living accommodation with 3 private ensuite cabins. 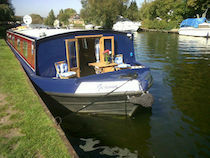 A bit of luxury whilst cruising on the River Thames. There is central heating via radiators and a fuel burning stove to keep you warm and cosy in the cooler months. Wifi on board. A sim card can be purchased at booking for Â£20.00 giving 2gb of data. This can be taken home with you afterwards. Beautifully fitted with bespoke Ash wood finish and granite work surfaces. 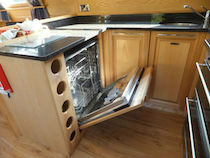 Fully equipped with all cooking utensils, crockery, cutlery, tablets are also supplied for the dishwasher on-board. There is a fridge, freezer, microwave oven, 5 ring gas stove with fan extractor above, grill and oven, kettle.. The kitchen has everything you could possibly wish for to create the perfect dinner. 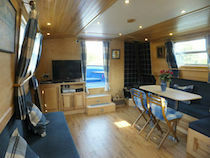 All cabins have ensuite with WC, hand basin and shower.